Birmingham's Black History Month returns this October for a packed programme of visual art, music, talks, performances and more. Here's Weekend Notes' Top Five events. A selection of photographs from the archives of renowned photo' agency Autograph ABP, that highlights the work of John Goto, Bandele 'Tex' Ajetunmobi, Raphael Albert, James Barnor, Colin Jones, , Neil Kenlock, Vron Ware and Syd Shelton. Taken over a period of more than three decades (though with an emphasis on '68-'78), the images range from social documentary (with scenes of protest and inner city racism) to staged portraiture, and aim, as the on-site exhibition text states, to "offer insight into the experiences of black people during an uneasy era signified by civic turmoil, racial discrimination and a wider struggle for social justice." 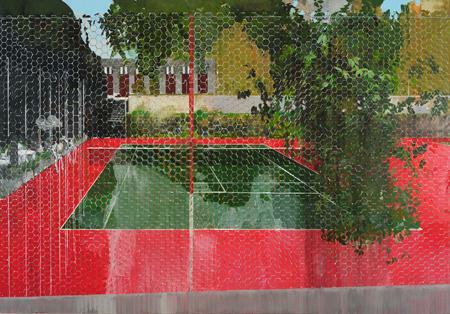 A new exhibition by Birmingham-born painter Hurvin Anderson, with works inspired by his life in Handsworth and also time spent in Trinidad in 2002. JoNina Abron-Ervin and Lorenzo E. Ervin, former members of the US Black Panther party, recount their stories, as well as the history and legacy of the Black community's resistance against racism and state oppression. The Black Panthers were a political party active in the US who came to prominence domestically and internationally as part of the Black Power movement during the 1960s, although their influence has continued. The show is described by organisers as "an eclectic mix of Jamaican Poetry and Comedy celebrating laughter, love and learning for the entire family and community," and debuted in 2009 in Jamaica before arriving in the UK in 2011. For 2013, the line up includes Oliver Samuels, Mutabaruka, Joan Andrea Hutchinson, Ity and Fancy Cat, Oral Tracey, Rohan Gunter, Dr Michael Abrahams and Ping Wing, plus - of course - writer, reggae artist and Pomedy founder, Yasus Afari. A varied night of Jamaican humour.